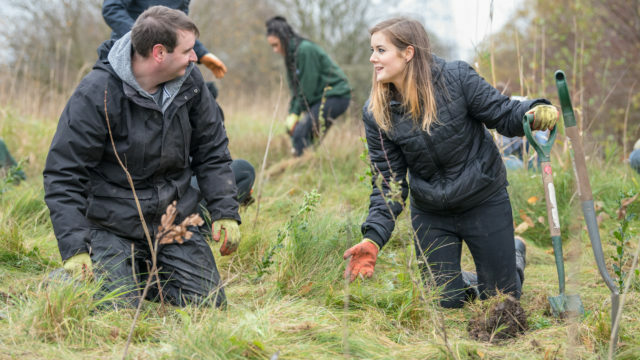 Monday the 26th November was the beginning of National Tree Week and to celebrate, we worked with City of Trees in partnership with MediaCityUK, aiming to plant 1,500 trees, a huge task on Tuesday! At Carbon, if you haven’t guessed from our name, sustainability is at the heart of our studio and through everything we do we aim to have a positive effect on our local environment. Our tree planting scheme has been running since 2007 and is something we are really proud of. With the assistance of local rangers, we started tree planting in our home city of Salford. 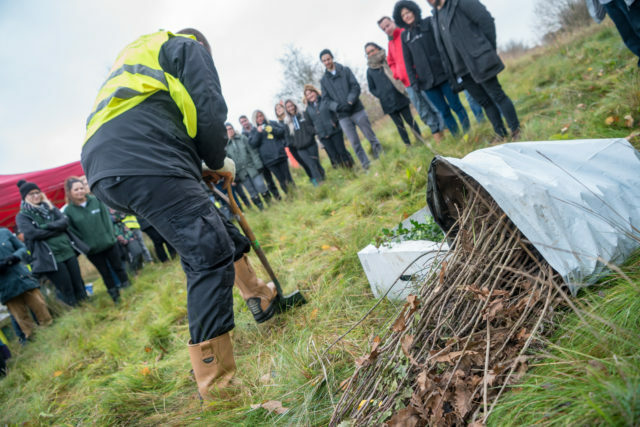 A tree is planted for every client project in local green spaces and schools, helping to reduce our carbon footprint and improve air quality and biodiversity. We plant a tree for every project we are commissioned to do and have already planted over 9,012! The event with City of Trees was an amazing opportunity for us to continue giving back to Salford’s landscape, involve people in our new home at MediaCityUK and invite our clients to join us, they have earned it with all their lovely design projects after all. The day began on Tuesday at 10am, with everyone walking over the forestry commission land and grabbing a hot drink and a biscuit as we were briefed on what we would be doing for the day by the lovely City of Trees staff. Everyone got stuck in and the morning was spent digging holes in the ground to fit a long Oak tree root and breaking up the frozen mud with our hands to secure the tree upright in the ground. By 12pm everyone was exhausted from all the physical effort. At lunchtime the second wave of volunteers came down and gave the morning team a new lease of life, pushing to get the last trees planted before it went dark. The turn out on Tuesday was amazing. So many people took time out of their days to come and volunteer planting Oak, Hawthorn and Holly trees…even when the rain came in the afternoon, there were still volunteers willing to carry on planting. We would like to say a huge thank you to Horwich Farrelly Solicitors, Community Integrated Care, Keep Britain Tidy, Inspiring Communities Together, Essential Control, Ordsall Hall and so many other volunteers who took part. Not forgetting all of our clients that we have completed design briefs for in the last 12 months, it is for all these projects that a tree is planted. This day was part of a much larger movement that underlines City of Trees. With an aim to restore Greater Manchester’s landscape by renewing abandoned, unloved woodland areas and planting a tree for every man, woman and child that lives in in the city…that’s 3 million trees, this was a great day to spread the word for them and introduce these volunteer opportunities to people that may not have know they were available. The positive feedback we have had so far about the day is really encouraging that what we are doing is valuable to the environment, knowing you can make a difference is one of the greatest feelings, watch this space for out next tree planting day.